You may not be aware of physical changes that can make your old workout risky. Try these tips to ease into exercise. Blame it on a job change, a chronic health issue, or simply a loss of motivation: whatever took you away from your regular exercise routine has led to a sedentary lifestyle. But don't assume you can jump back into the same exercise regimen you followed when you were younger. "Your body has aged, and things have changed," says Dr. Clare Safran-Norton, clinical supervisor of rehabilitation services at Harvard-affiliated Brigham and Women's Hospital. Age-related physical changes aren't always obvious. "We lose muscle mass and strength as we get older, and the muscles become less flexible and less hydrated," says Dr. Safran-Norton. Arthritis weakens joints. And vision changes, neurological disease, joint pain, or problems inside the ear can throw off your balance. Meanwhile, underlying conditions that become more common with age, such as high blood pressure or cardiovascular disease, may put you at risk for severe health consequences if you suddenly start exercising like you did when you were 20. Jumping back into a workout without accounting for physical changes sets you up for injury. "Lifting weights that are too heavy or taking an exercise class that's too strenuous often causes trouble, and it's usually a muscle tear or a strain," says Dr. Safran-Norton. heart attack or stroke from an intense workout, particularly if you have undiagnosed high blood pressure or heart problems. You might also fail to recognize symptoms of heart disease if you are taking medications that mask them, such as beta blockers. If you are taking a beta blocker and start exercising again, you can't rely on heart rate to determine overexertion. You should stop your workout immediately if you experience any symptoms that could indicate heart disease. Sit up straight near the front of a chair with your feet flat on the floor. Extend your right leg straight in front of you with your right heel on the floor and your toes pointing toward the ceiling. Lean forward from your hips, placing your hands on your left thigh for support. Keep your back straight. Hold 10–30 seconds. Return to the starting position. Before beginning any kind of exercise program after being sedentary, get the all-clear from your doctor, especially if you have heart disease, risk factors for heart disease, or lung problems. Ask if you need to monitor your heart rate during exercise. 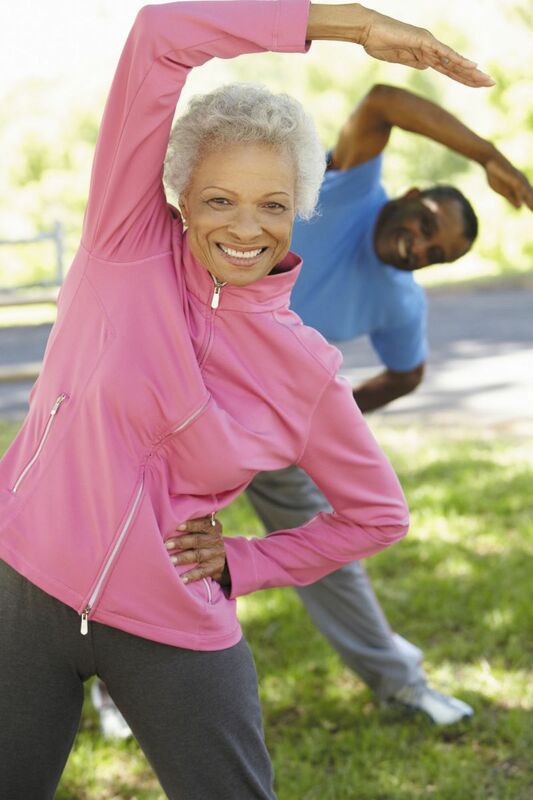 Once you have the green light, think about which type of exercise routine appeals to you, such as taking a tai chi or yoga class, doing a gym or home workout, or going for a brisk daily walk. Make it something you'll want to do, so you'll stick with the program. Think of your current abilities as you consider your options. "If it's a yoga, cycling, or tai chi class, you'll need adequate strength and flexibility. You need to be able to do the basics, like raise your arms over your head and lift your legs easily," Dr. Safran-Norton says. Then, ease into exercise. "Start with a low-intensity workout for 20 or 30 minutes. Increase the intensity and length over time," suggests Dr. Safran-Norton. "It's the same for working with weights. Try a slight resistance at first, and then increase it gradually." To avoid injury, warm up your muscles before exercising, particularly if you are out of shape. Dr. Safran-Norton recommends five minutes of brisk walking or time on an elliptical machine to get blood flowing to the muscles to make them pliable. You'll need to stretch afterward, and repeat the whole process two or three times a week. Don't feel self-conscious if you're not the fittest person in the room, if you need to modify a particular exercise, or if you need to take breaks. Since you're older now, also be wiser — about your fitness. For more information, check out the Harvard Special Health Report Starting to Exercise (www.health.harvard.edu/e).